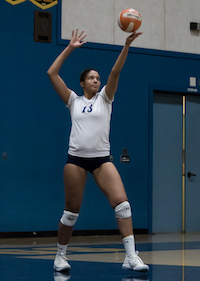 One may be the loneliest number, but being the only senior on the Alhambra High girls volleyball roster has made Sterling Parker reach new levels even she thought weren’t possible. Hosting Diablo Athletic League foe Acalanes-Lafayette on a cool Thursday night in Martinez, a back-and-forth battle had built a playoff-like intensity. Down two sets to one, the Bulldogs would rely heavily on their co-captain. But not entirely in the way you might think. She knew she couldn’t do it all herself. “I trust you” and “We got this” were constant phrases being yelled out by Parker as she attempted to will her team to victory. Set four was a slugfest with both teams struggling to take control. 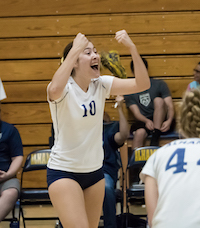 It wasn’t until Parker broke the 13-13 tie with an emphatic kill that came crashing to the floorboards with max velocity that Alhambra finally was able to build some distance on the scoreboard. The Bulldogs won the set 25-18 to force a decisive fifth set. 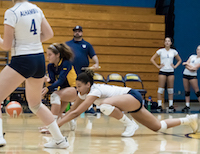 The final set played out very similar to the fourth — Parker and crew were able to turn hustle plays into points with continuous kills and aces. The Bulldogs won the final set 15-9, pushing their record to 19-3 on the season and a 1-1 mark in league play. Parker finished the match with 28 kills, five digs and three blocks. A complete player, Parker can just as easily come up with the game-changing dig as she can the game-winning kill. Parker may be a great floor general, but her stats show she is a player through and through. 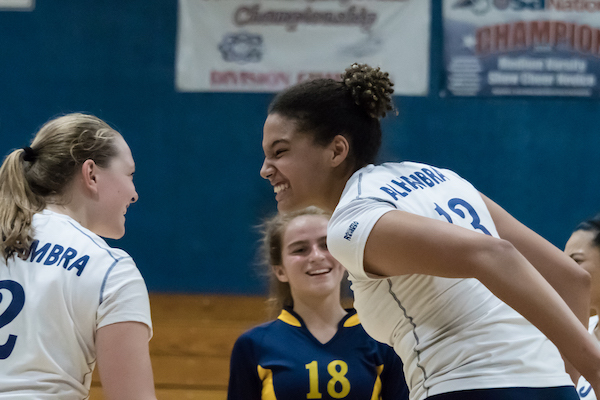 After the Sept. 20 match, she led the Bulldogs with 273 kills, ranking ninth overall in California. She also boasted 138 digs and 33 aces with eight matches remaining in the regular season. She’d already surpassed her dig total from last year and was on pace to have more blocks and aces. Parker may be the clear leader of this team, but she insists she wouldn’t be where she is as a player without her teammates and coaches pushing her to a new level each day. She asserts that coach Marchesano was the first person to believe in her skills on the court. It’s easy to assume as an outsider that the game comes easily for Parker — she will attest it hasn’t always been that way. Believe it or not, Parker didn’t start playing volleyball until her last year of middle school. Her original loves were dance and softball. After eight years of doing both concurrently, she took a year off from playing competitive sports. After the time away, she received an ultimatum from her parents that it was time to get back in the mix. Reluctant and somewhat forced, Parker settled for volleyball — determined not to mold to the stereotypes and play basketball just because her 6-foot, 2-inch frame says she should. It wasn’t love at first spike. 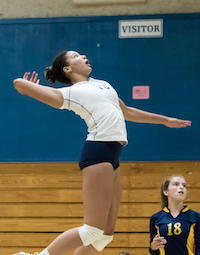 Parker winds up for a serve during Alhambra’s late-September victory over Las Lomas-Walnut Creek. 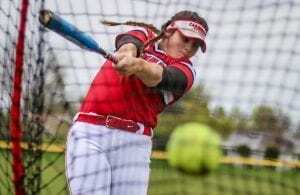 Things began to click at the beginning of her freshman year — this is the time she recalls truly starting to love the game. The hard work and dedication started to pay off quickly for her. She has played varsity all four years. The Bulldogs reached the North Coast Section playoffs in her first season, an accomplishment they hadn’t reached in more than 30 years. Last season, they reached the finals. 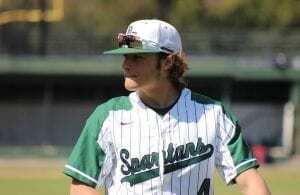 Now a senior, Parker is hoping to lead the Bulldogs to a fourth straight playoff appearance and second trip to the finals. 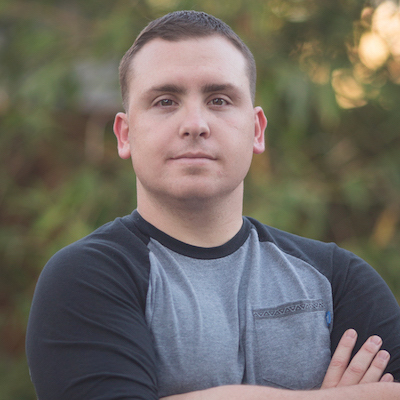 Regardless of how similar this season seemed to the previous three, Parker states the dynamic is vastly different. After returning just three varsity players from the 2017 season, these young Bulldogs had to learn together what it meant to play at the highest level. As expected, growing pains were felt. However, Parker explained being there for the younger girls when needed and providing player-on-player coaching has been a rewarding experience. The coaching staff insists this group has what it takes to be great. “Having girls that still have room to improve only makes us more dangerous than the teams with a bunch of seniors,” Marchesano said. Parker vows that youth will not deter the lofty goals the entire staff has for the rest of the season. Ending the 2017 season with a NCS championship game defeat has made the group hungrier than ever. Junior outside hitter Michaela Rezentes is second on the Bulldogs in kills. With countless awards, stats and a 4.0 grade point average, it’s safe to say Parker will have no problems leaving a lasting impact when her Bulldog career comes to an end. 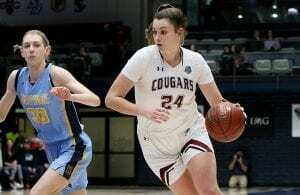 At that point, Parker will begin preparing for her freshman year at the University of Colorado. She has orally committed to a full athletic scholarship and plans to officially sign in November — shortly after her final visit on Oct. 26. All signs point to Parker excelling at the next level. Parker plans to study psychology at Colorado so she can continue to help people later in life. She credits the desire to help people from her parents. Her father, Warren Parker, a longtime insurance salesman, left his job of 15 years to become a student counselor at Dublin High. “It was so inspiring to watch my father do what he loves, regardless of a paycheck or a title,” she said, expressing that her parents have instilled the desire in her to do what makes her happy — while helping as many people as possible along the way. She’s got the helping part down. Perhaps her last act for the Bulldogs will be helping them raise a championship banner.